As I remember Guruji, B.K.S. 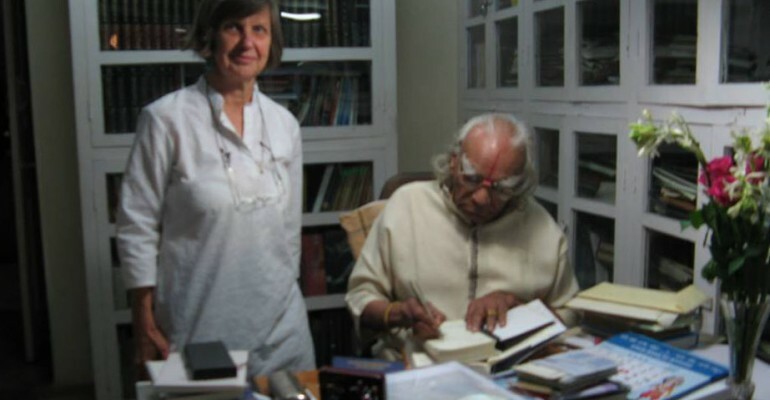 Iyengar, every day, I am in awe of his gifts to us. He left such a legacy for us all. There is a lifetime of reading to do, asanas to practice, pranayamas to attempt, philosophy to understand and live by. Light on Yoga is there every day for us to study, there are eight volumes of Astadala Yoga Mala to read and re read and so much more. His brilliance and dedication is unparalleled in any field. He was completely devoted to the path of yoga. Every day he spent doing yoga, living yoga, writing about yoga, being in yoga. I am so grateful for the opportunities I had to study with him directly. I was humbled and touched deeply that on the eve of his 95th birthday, he was willing to help me with a severe shoulder injury. He admonished me when I wasn’t working sincerely enough, or not understanding his directions. His fire and passion were ever there. Photo in the library. It was sad to see that in 2013, he could no longer navigate the steps to his wonderful library.